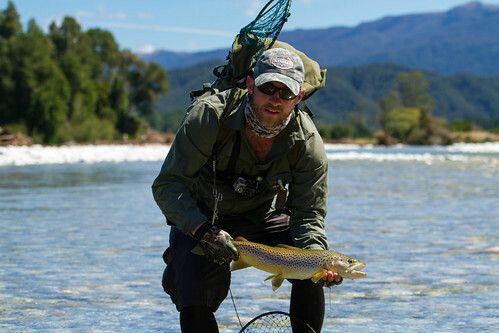 I picked Craig up at the airport, dropped him off at the car hire place to sort out our fishing wagon (read as a cheap Nissan saloon) for the month and then we attempted to get a hold of Alex who had been fishing around the North end of the South Island. Craig had a plan to gish for around 10 days around the top and I was all for it until Alex finally phoned in and advised us it was not worth it. He said the area had been too badly affected by the new year floods and that a lot of the fish were very skinny. 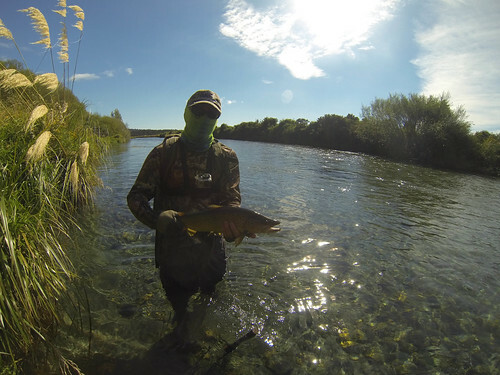 During the conversation a quick plan was mashed together and we arranged to meet the following day in Hanmer Springs and get fishing from there. 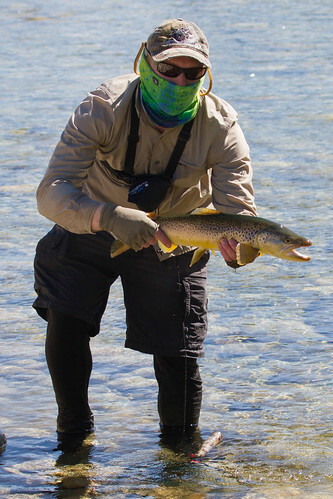 The first day saw a small fish bashing session from which I quickly retired as I was tired of the 1/2lb onslaught you get when you find a pod of small fish and every other cast attracts yet another suicidal, mini, trout-coloured torpedo. The day afer was absolutely bizarre! We arrived at the lower reaches of a river, had a quick look and it was running clear. The deep pools were a little cloudy but apart from that it was more than sightable. I dropped Craig off with Alex further downstream and carried on up. I decided to drive the length of the river and give it a look before fishing and what I came across had me completely perplexed. 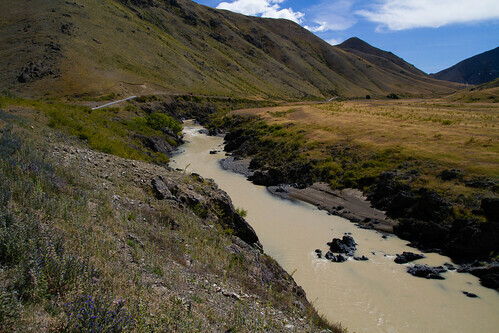 The river turned from clear to milky to completely yellow mustard in a very short stretch. My spirits completely sank as I’d been planning to fish this since before I arrived in the country. I’ve never seen a river so badly coloured in the middle and upper reaches yet have the bottom reaches clear. It wasn’t spreading down quickly either, it appeared to be getting filtered in one section where the river braids, I don’t know if the gravel bed was acting as a filter but it certainly looked that way. Absolutely amazing but very annoying. I ended up sleeping in the sun all afternoon, it was a great sleep but not much on the fishing front! 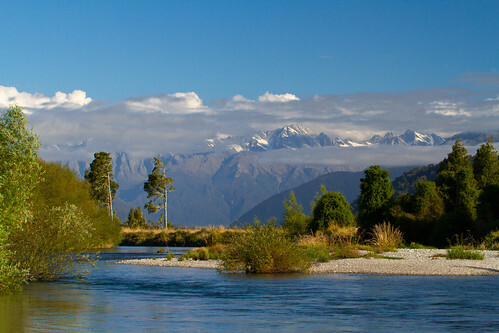 We drove for Reefton that night and based ourselves from here for the next 4 or 5 days. The fishing was good but it’s a heavily pressured area of the country and that’s evident immediately by cars at accesses, footprints on the river banks, well trodden paths and spooky fish of course. 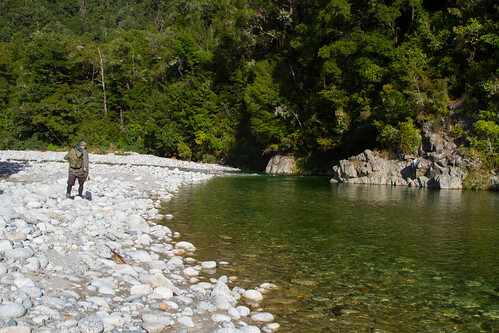 The first day in this area Craig and I fished an absolutely gorgeous river, clear water, sun shining and a lovely structure of pool, run, pool, run… I’ll share the story of one fish and let the pictures do the rest. The first fish we came across was sitting in a pool with 2 or 3 others but this was the only one holding station and feeding hard. 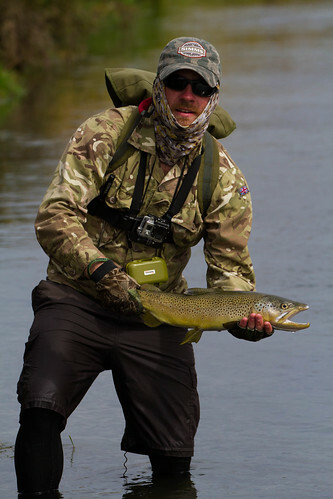 Craig was on strike and must have tried 6 or 7 flies with the fish coming to inspect but ignoring every single cast. Eventually it was my turn and I fared exactly the same until the 3rd cast I decided to plonk the tarantula straight down on top of his head and to my surprise and Craig’s too I think, the fish turned down on the fly and engulfed it. Just goes to show, never give up and don’t be afraid to mix up strategies. 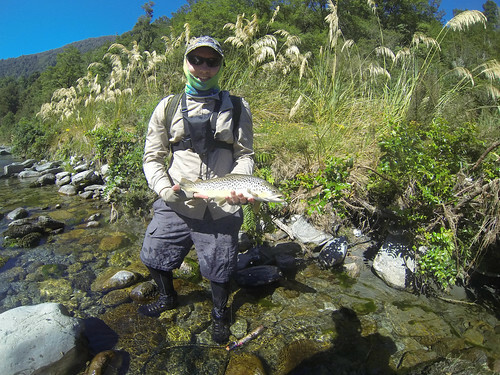 Over the next few days we fished a number of different rivers and faired much the same. Fish spotted and very spooky but we were still picking up fish even if they were hard fought for. On one river I had a shot at a really good sized fish but he was in one of the hardest current seams possible, right on the mix of a very fast current and completely slack current. No matter what strategy I employed I could not get the drift and eventually he spooked. Bugger. It’ll stay in my memory for a while though, ever analysing as to whether I could have done something differently. I nearly forgot and I’m editing in this line after writing out the rest of the post. We fished a river for a day, we saw one fish. End of. Days like that are tough but they come along, the only thing you can do is keep your spirits up and move on the next day! The river was gorgeous but running so low on its bare bones. Craig was enough of a gentleman to spot the first fish and give it to me, he must be gutted it was the only fish! The highlight over the first week for me was definitely that river but a spring creek lower down the West Coast is definitely up there. 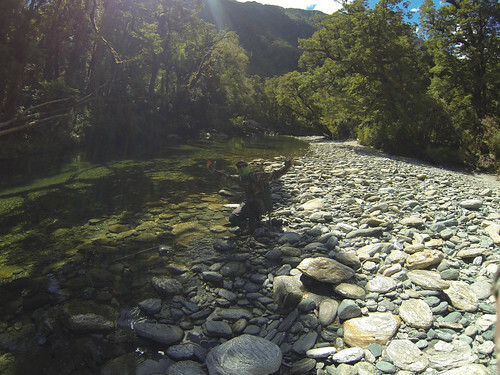 A Scottish guy called Andy who lives at the Domain camp in Reefton recommended it to us and it didn’t disappoint. Conditions were very difficult, intermittent sunshine and strong winds, never a combination that leads to ideal spotting conditions. 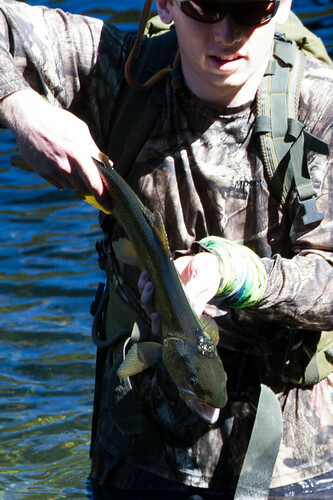 Even in these poor conditions Craig was able to spot the first fish and subsequently catch it. 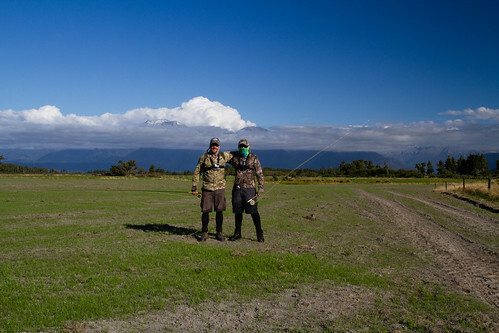 We fished for a couple of hours and had 2 fish each, this was excellent fishing given the conditions. We were stoked! I was broken off by a fish too and unfortunately have the footage of this one. The outakes edit is going to be bigger than the actual movie at this rate! 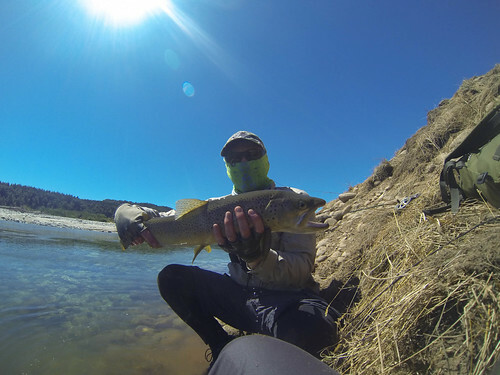 The spring creek was great, it was deep and fast flowing in places but the fish were quality, fought very hard and all took dries. What a great way to spend an afternoon and just look at the backdrop. Thanks Andy. The last two days saw us on a backcountry river with a little hike in. It was completely not what we expected, full of deep slow flowing pools and not really like a normal river at all. In saying that though, we still managed fish, I had a couple and Craig unfortunately lost one and was broken off by a good sized fish. There were plenty of fish but getting access where you could cast was a completely different matter. At one point today the pair of us were standing on different logs of dead trees trying to get casts out to cruising fish, none were successful… Have a look at the head of the fish below, it seemed pretty much on its last legs, no fight and a big clump of fungus on its head. Anyone have any ideas as to cause/what it is? That looks simply stunning, well done lads!!! Cheers Stephen, now off hunting again! Awesome scenery Scott and good times by the sound of it! Good luck for the next stint! Beautiful country. Good luck, hoping for hogs for you both.